Supine comes from Latin and means to lie flat on one's back. In the semi-supine position, the person lies on their back but with the knees bent. Semi-supine is a specific Alexander Technique term and refers to the position used to practice the Lying Down Procedure. The semi-supine position, as taught in Alexander lessons, requires us to lie down on our backs with our knees bent, feet resting on the floor and our heads supported by one or more books, according to each person's Head Neck Back relationship. The Alexander Teacher will show the pupil the number of books that are required in order to align his neck and spine correctly. It is important for us to remain alert and aware whilst practising, so that we can use our thinking to aid the process of bringing about change in our use. If we lie down and drift off into a sleepy state, we will not learn more about our use and misuse, nor will we develop a tool to help ourselves with. The Lying Down / Active Rest Procedure is included as part of most Alexander lessons and is taught with the pupil lying on the Alexander table. 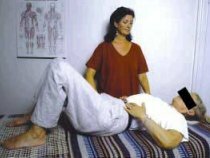 Whilst the pupil lies in semi-supine, the teacher gently works on him to help him develop his awareness and to let go of old habits. The pupil will be asked to give himself directions whilst this is taking place, in order to bring about changes in the way he uses himself and his body. All Alexander pupils are encouraged to use the Lying Down Procedure on their own, ideally on a daily basis, in order to work on themselves. This needs to be practised whilst lying on a carpeted floor, rather than something soft like a bed, which will not give the body adequate support. However, floorboards alone are rather hard and drafty, so do use something like a rug underneath you. For further information, you may like to read my notes about using the Lying Down Procedure.